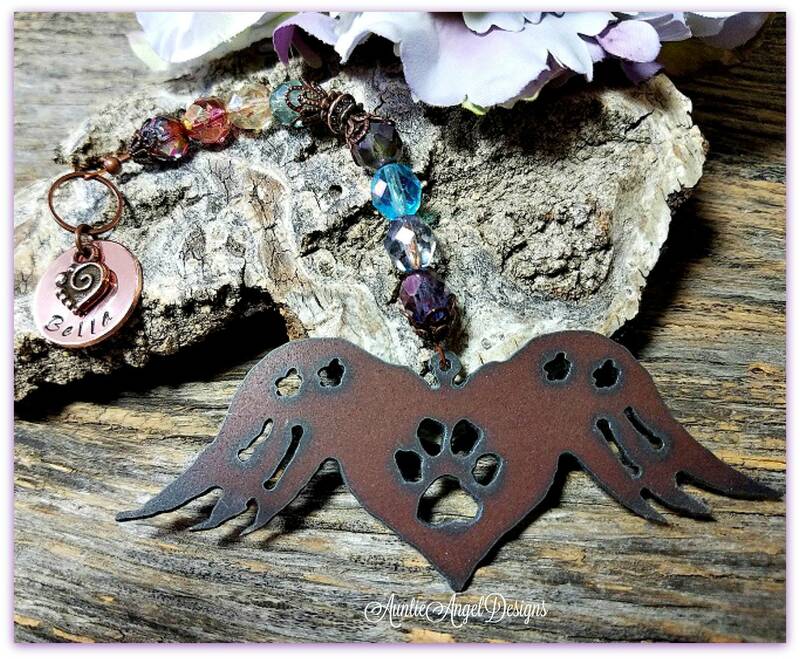 The "Rainbow Bridge Winged Heart Pet Memorial Ornament" is a unique beaded piece by Auntie Angel Designs for the Christmas holidays and beyond. 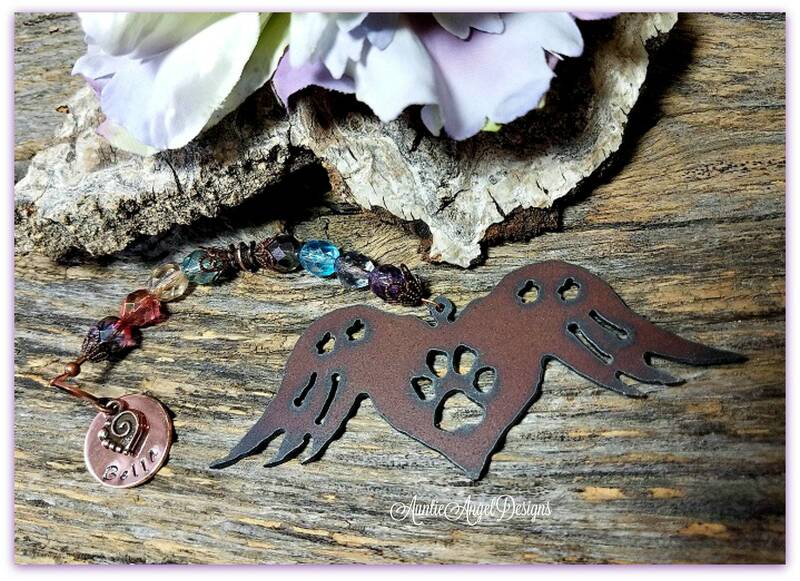 This gorgeous, yet simple Rainbow Bridge-inspired piece is meant to remind you always of your angel pets at the Rainbow Bridge, knowing one day you will be reunited. 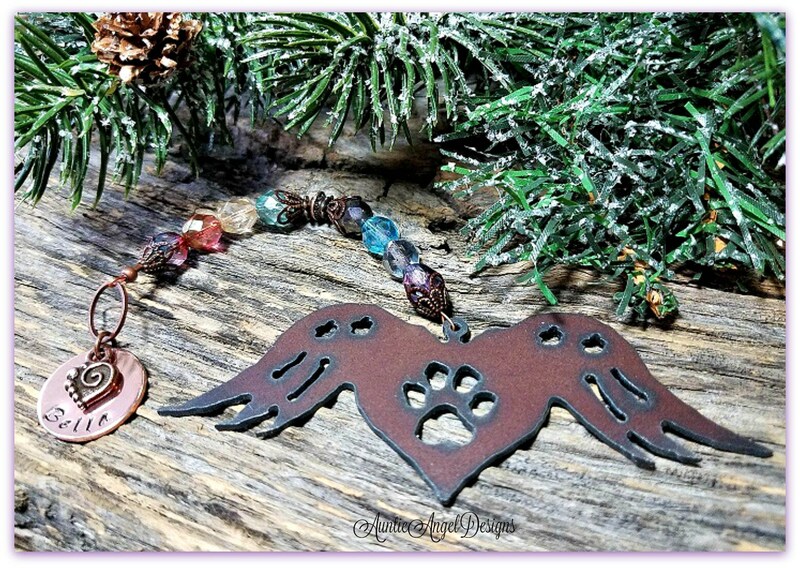 Each rustic 18-gauge metal angel wings paw print cutout is approximately 4" wide by 1-1/2" tall with the thickness of about a quarter. The metal winged heart cutout dangles from a strand of crystal-faceted beads in colors of the rainbow. The beads are in a luster finish and beautifully capture the light, like next to a window. Each piece is strung on flexible wire and finished with fine filigree antiqued copper bead caps. 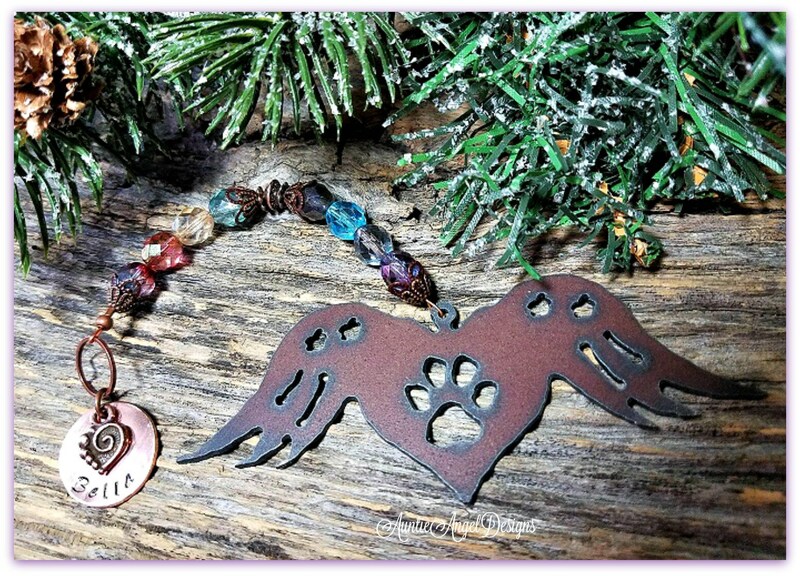 This ornament's total beaded length including the metal angel winged heart paw print is approximately 5-1/4" long. Add this piece as a wind-catcher focal, suspend with monofilament string to your car's rear-view mirror, clip the copper ring to your purse (clip not provided) or add an ornament hook (provided) and dangle this piece from a place of your choosing. 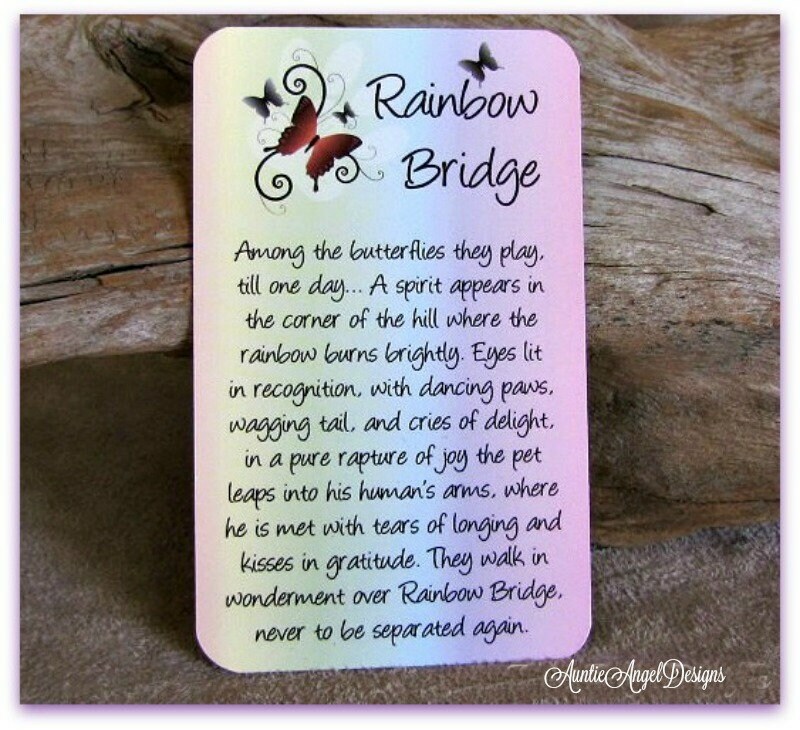 As part of your purchase, I include my own version of an ADORABLE Rainbow Bridge-themed wallet-sized memorial keepsake card (pictured). 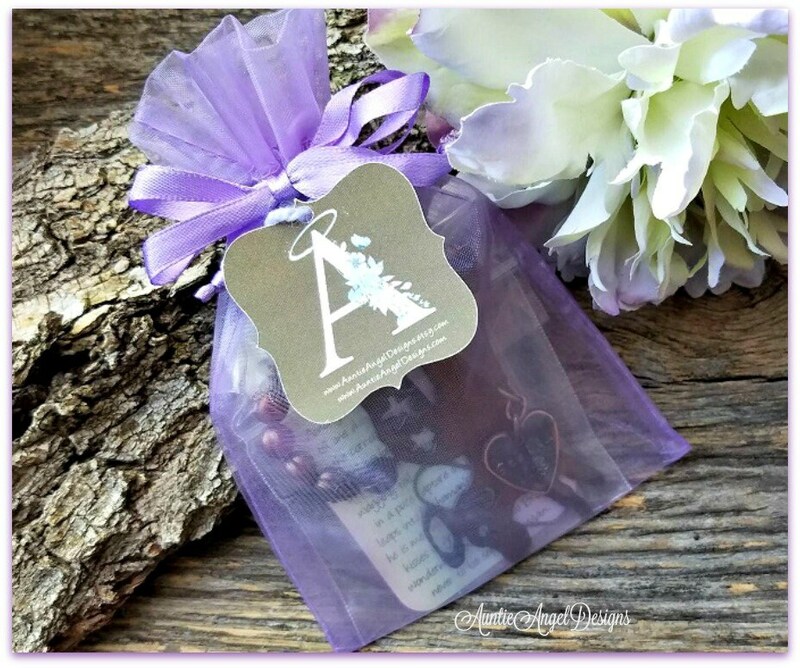 PLEASE LEAVE YOUR PET'S NAME IN THE NOTE TO SELLER BOX DURING THE CHECKOUT PROCESS IF NOT PROMPTED BY ETSY FOR PERSONALIZATION! NOTE: "Ornament only" means there will not be a stamped name disk with spiral heart charm. 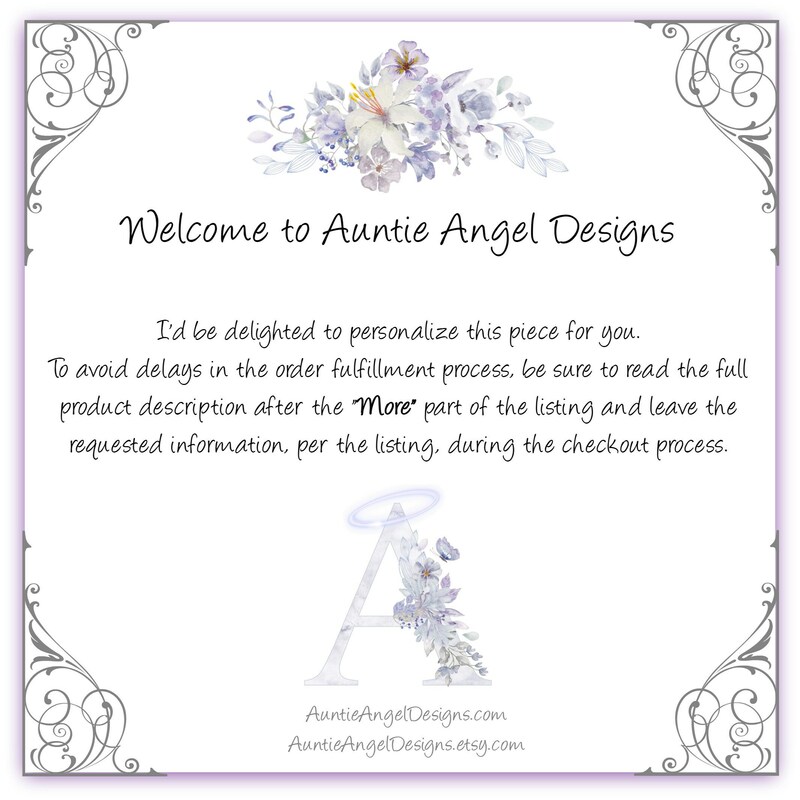 Thank you for shopping with Auntie Angel Designs! What a gorgeous ornament! Packaged beautifully, and it shipped super quickly. Thank you so much, we love it! My neighbors pup just passed - this is a beautiful gift for me to give her. My friend really loved this special ornament in memory of her two dogs who recently journeyed to the bridge. Thank you!